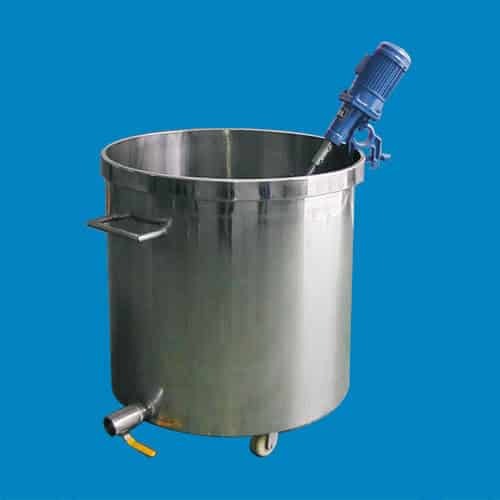 They are devices used to stir or mix fluids, liquids specifically. The choice of the agitator depends on the phase that needs to be mixed (one or several phases): Liquids only, liquid and solid, liquid and gas or liquid with solids and gas. Depending on the type of phase and viscosity of the bulk, the agitator can be named mixer, kneader, dough mixer, amongst others. The agitators use in liquids can be placed on the top of the tank on vertical position, or horizontally (on the side of the tank) or less common, agitator is located on the bottom of the tank. The agitation is achieved by movement of the heterogeneous mass(liquid-solid phase),to the impeller. This is due to mechanical agitators, to the rotation of an impeller. The bulk can be composed of different substances and the aim of the operation is to blend it or to improve the efficiency of a reaction by a better contact between reactive product. Or the bulk is already blended and the aim of agitation is to increase a heat transfer or to maintain particles in suspension to avoid any deposit.